Do you know what a jumpshot is? How many points is a free throw shot worth? How many players are on a team? 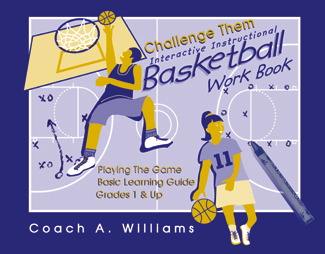 Coach A. Williams, and his highly readable new book “Challenge Them—Interactive Instructional Basketball Work Book” answers all these questions and more. This learning guide is designed for grades 1 and up. No matter your current level of knowledge of the game, by the time you’ve worked your way through this book you’ll be able to draw a 1-3-1 offense design to match a 2-3 defense. This book is a great resource for parents, teachers and coaches to help a child better understand the game of basketball. Not only will your child learn the rules involved in the game, he/she will also learn how to prevent injuries, how to practice good sportsmanship, how to resolve conflicts—lessons they will use their entire life. This book is a must have for all sports for any sports-loving child.